April is National Poetry Month, sponsored by Academy of American Poets and other poetry organizations. Last year, we posted thirty poetry activities, one for each day of the month of April—and the good news is that we’ve got an updated poem-a-day activity for you this year too! Each day has a link to a different kind of poetry writing, either a specific poetic form, like sonnets or acrostics, or poetry focused on a particular topic, like seasonal haiku or color poems. The materials range in grade levels, but can usually be adapted for any age (even college students). So heres the challenge for you and students: I found a different poem for every day of the month. How many different poems can you write? And remember that even if you don’t have time in class to write a poem each day, these poetry activities will work any day of the year! 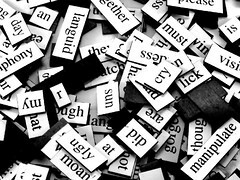 Cross-posted to the NCTE Community ReadWriteThink.org Group and the Reading and Language Arts Group on the Thinkfinity Community.